At the end of World War 2, in 1945, Hunmanby was virtually the same as it was when Humphrey-Brooke Osbaldeston re-designed it in his 1809 Enclosure. The only new road was Simpsons Avenue which was opened-up in 1939 for council houses, replacing many of the cottages that Humphrey had built, now condemned as unfit and in the process of demolition. The population of approx. 1500 had remained unchanged for over 100 years and most had been born in the parish or near-bye. Sir Denis Readhead Bayley had bought the complete Hunmanby Estate, including Hunmanby Hall from the Mitford family in 1919 and in 1921 it was arranged that all tenants could buy their properties at a reasonable valuation (arrangement being made for mortgage facilities). Any property and land not sold was put onto the open market in an auction in 1922. Until these sales the only building done in Hunmanby was by the estate workmen on the instruction of the Lord of the Manor. Now all lands/properties had become freehold, private development began, mostly in ‘fill-in’ sites down Bridlington Street, Stonegate and Muston Road. Then outbreak of WW.2 in September 1939 brought everything to a halt. The reader must realise that apart from several small-holdings, the village consisted of properties along both sides the main streets. The centre of Hunmanby was still open fields used mostly for grazing. 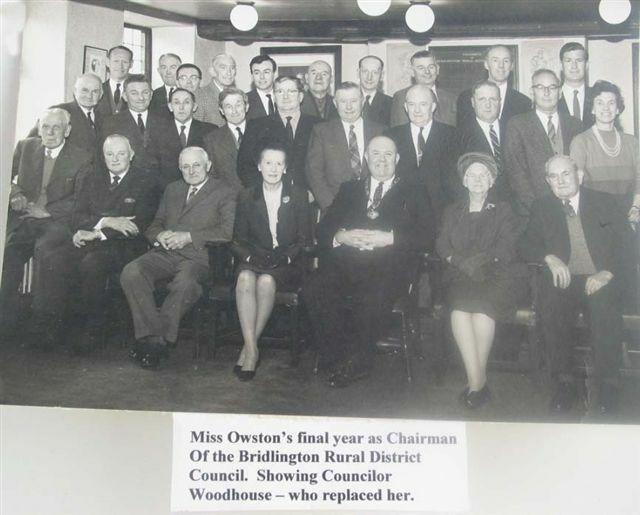 This then, was the position which the late Miss L.M.Owston ‘inherited’ when she became Chairman of the Hunmanby Parish Council, Bridlington Rural District Council (the parent Council to Hunmanby prior to the re-defining of Parish boundaries in 1974) and an East Riding County Alderman, sitting as vice-chairman of the East Riding Planning Committee at County Hall, Beverley, also a Justice of the Peace (JP.). Practically all the advances which have occurred since 1945 are a direct involvement of Miss Owston in one or more of her civic capacities. She was also a committed Methodist, worshipping each Sunday at the Wesleyan Chapel. Her late father had been appointed (although in retirement) as Clerk of Works for the alteration of Hunmanby Hall into Hunmanby Hall Girl’s Boarding School and for his services was placed on the Board of Governors at HHGBS. On his death in the late ‘30’s, Miss Owston took his position on the Board. (She was subsequently to chair the Governors of six more County schools including Hunmanby County Primary.). Born in York, Miss Owston had strong Hunmanby connections. 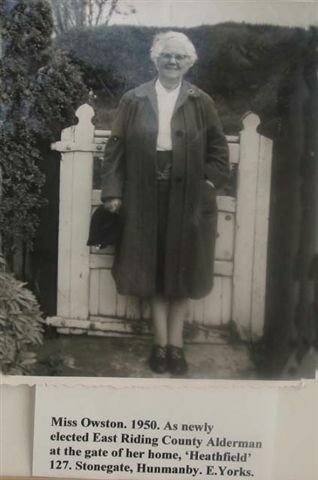 Her mother was a ‘Hunmanby’ Sellers who was living in Ganton. She married an Owston from Sherburn whose mother had strong Hunmanby associations. Consequently she spent many early holidays in our village. Attending secondary school in York she was one of the only two senior girls to take ’Typing and Bookkeeping’. This was taught on an early typewriter the school bought specially for this ’class’. The intention was that she would look after the office side of her father’s business (he was a master builder who speculated throughout the York and Harrogate area). This she did until his retirement to Hunmanby in 1925. A keen Girl Guide she was soon Captain of the 1st.Hunmanby Girl Guides - and Brownie Pack. From the foregoing it will be appreciated that in 1945 she was in a prime position to influence a growing village. The first large building project took place at the bottom of Northgate at it’s junction with Outgates Lane. The Mitford Road estate of council houses was built by Stanley Marshall in 1947-48. These houses were meant to house anyone still living in sub-standard housing (no bathroom, toilet etc). Upon completion, most ex-servicemen and similar etc. were successfully housed. Selection for tenants was on a points system which was overseen by the Bridlington Rural District Council on which Hunmanby had two councillors plus Miss Owston who was chairman. Private building was restricted to ”class’C’” and could only be brought about in fill-in sites. Many conditions were required - one being that one of the applicants had to be an ex-serviceman - and again the B.R.D.C. was the controlling body. Town and Country Planning brought restrictions which prevented ribbon development along village roads and this was controlled by the E.R.County Planning and B.R.D.C. approval. Careful perusal of the above will leave the reader in no doubt as to what a powerful position Miss Owston held. To her great credit, she was never accused of favouritism or similar and her word was always accepted and kept. However, she was to wield even greater influence in the 1960’s.and 70’s. Compared with many villages, Hunmanby stagnated as regard ’new developments’ until the late 1960’s. Then three separate building plans were approved. Off Bridlington Street, the Fountayne Road development was started and approximately the same time a development known as Cedar Park - later High Croft - was commenced at the junction of Muston Road and Malton Road. Within six month a development off Sands Lane, which connected to the Fountayne road ’estate’ took place. Naturally these were intersected by a number of roads and closes. I was privileged to be present when Major Crawford, Chief County Planning Officer for the East Riding was discussing these developments with Miss Owston and well remember his advice:- “Now Lucy, if we are not careful the roads on these estates will become ’rat-runs’ for motorists wishing to avoid the village centre. My advice is to place plenty of twist and turns in these new road which will discourage them”. Miss Owston took this to heart as all the new roads on these purely residential estates bear witness. It now rested with the Hunmanby Parish Council to name these roads. Miss Owston drew upon Hunmanby manorial history, all the roads bearing names of manorial Lords or similar. Hunmanby Council Primary School was becoming overcrowded and plans were put forward for a replacement - but where ? When the Church sold their Priest Close fields, Miss Owston managed to raise funds for purchasing same. It was several years before further funds became available from the E.R.Education committee but when they did Hunmanby had the ideal site and again under Miss Owston’s pressure a new school was built (in two phases.). The existing school was sold to the Parish Council for conversion into a Community Centre. Whilst Miss Owston had retired by the time the Community Centre was organised, she was the prime mover. 1970 saw the B.R.D.C. debating whether to build nine more council bungalows in Prospect Place, adjacent to Vicarage Close or go for a two-story development which would house up to 52 people in single and twin-bedroom flats. Whilst again, Miss Owston had recently retired from her Civic duties, her knowledge of the two-story development system in other locations, greatly influenced local councillors who eventually adopted this plan, today Hungate Court. The East Riding County Libraries had never had a permanent place in Hunmanby although they had temporary housing in several properties. The last provision the old East Riding County Council made for Hunmanby prior to its abolition in 1974 was to buy a site in Stonegate and build a permanent Library for the village. This was only pushed through at the last minute by Alderman Owston’s personal intervention. In the 1950’s, plans were submitted to enlarge the Wesleyan Chapel in Bridlington Street by enlarging towards the rear. This was turned down on the grounds of insufficient parking accommodation - amongst other considerations. Hunmanby Hall Girls Boarding School had long wished to obtain a Chapel of its own. Unfortunately a clause in the sale to the school forbid ’any place of worship’ being added to the school ! A new Methodist minister had recently taken over the Filey circuit, Rev. Arnold Cooper. He became extremely interested in a ’new’ chapel for Hunmanby. Naturally, two of his most important Hunmanby colleagues were Miss Owston and Miss Hargreaves, the headmistress of Hunmanby Hall. Together, these three struck the idea of giving to the village a plot of land adjacent to Cross Hill which belonged to Hunmanby Hall. When the land was no longer the property of the Hall there was no reason why a village chapel should not be built upon same, providing the existing chapel in Bridlington was sold off. It took three years of hard persuasion by Miss Owston at both County and Rural levels to finalise the matter but in the end, largely by her constant expertise it was accepted. Within two years a new Wesleyan Methodist Church was completed, the old chapel being sold for conversion into a supermarket. Another of Miss Owston’s triumphs. During W.W.2. 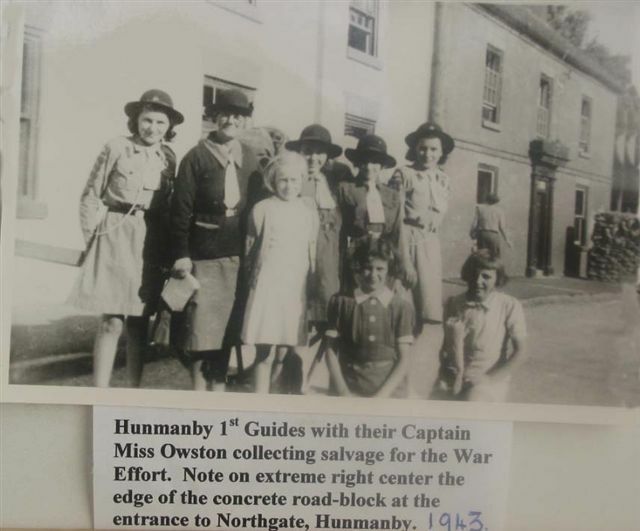 Miss Owston, a true patriot, maintained her troops of Guides and Brownies. During the great salvage drives they collected salvage for the war effort and also, as a village historian, Miss Owston regularly walked them along the village field paths so that they may still be claimed and not lost through lack of use. Her only failure was the old smugglers path from Hunmanby to Butcher’s Haven, next to Primrose Valley. The seaward end, from the main Scarborough/Bridlington road (A164) to the beach was occupied by Butlins Camp which from 1941 became a restricted military area (it was occupied by the RAF Regiment) and thus inaccessible to the general public. Since coming to the village Miss Owston had shown great interest in it’s history. Whilst at County Hall in the 1940’s she discovered that the deeds and papers relating to the late Sir Denis Readhead Bayley, last owner of the Hunmanby Estate were in the possession of a Nottingham firm of solicitors. She managed to get them transferred to the East Riding County Archives at Beverley. This enabled her to peruse them thoroughly. 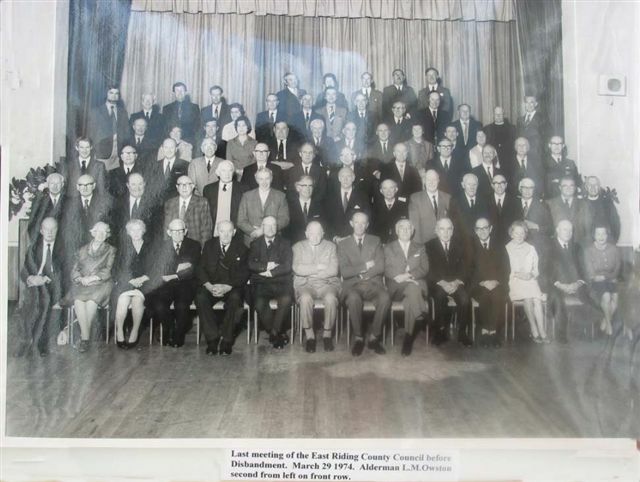 In the 1940’s a number of the elders of Hunmanby such as of Hunmanby such as Mr Frank Witty (himself an authority upon Hunmanby’s background) and ’Tinner’ Young (a sprightly ninety years old whose remarkable memory went back to the 1860’s). Getting these (and others) to visit her and recall Hunmanby’s background, she wrote the first definitive history entitled “HUNMANBY. A story of ten centuries”. Already an accomplished writer of many articles on her chosen subjects, this book firmly established Miss Owston as an author of great merit. Out of print today, copies remain in libraries etc and all more recent histories of Hunmanby lean heavily upon this book. When the ‘Victoria County History’ was re-issued in the 1960’s, this primary historical source was completely brought up to date. Miss Owston was consulted by the editor and the section on Hunmanby is 90% her work, for which she is fully credited. The early 1950’s found a number of ‘incomers’ retiring to the village. They showed a keen interest in its history. 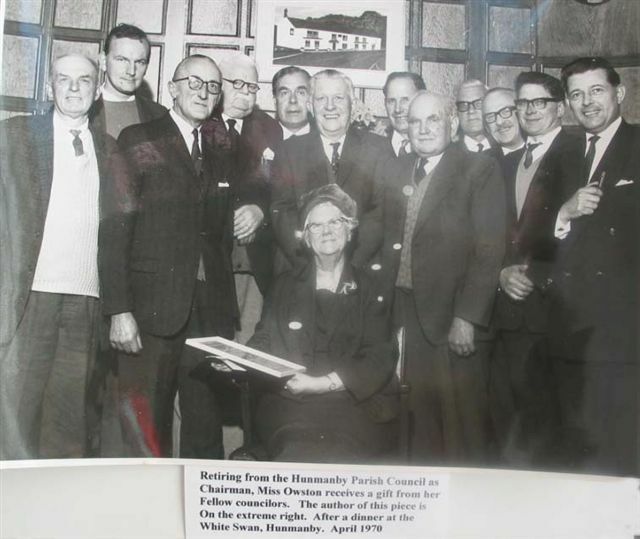 Miss Owston formed the HUNMANBY LOCAL HISTORY GROUP in 1955. Originally, mostly composed of older village worthies, who ‘passed on’ our history to these newcomers. Upon her retirement as Chairman, the author became the next president and the group is still going strong. The above summary indicates the major items of Hunmanby touched by E.R.County Alderman L.M.Owston which virtually comes under her civic ’umbrella’. Equally vital was her commitment to village activities. Long-standing member and chairman of the Women’s Institute, founder member of ‘God’s Acre’ Cemetery Committee etc. In November 1945, the Widow’s Procession (a subject which will be covered in these archives at a later date) was restarted. Sadly it rained heavily throughout. Likewise in 1946. Although nothing to do with the Parish Council, as the senior village civic function, the question of ’should the Widows Procession be dis-continued or not’ was brought up. By now, there was no dire need to provide widows with ‘Xmas Fare’ - the original reason for the procession - due to the recent post-war Social Service which provided ’for all’. Hence it was decided to end this village custom Debating whether to institute something similar, but in the summer months, to hope for better weather, was strongly debated. Finally, in 1949 a village Carnival was instituted, to be held in August. This was entirely Miss Owston’s idea. 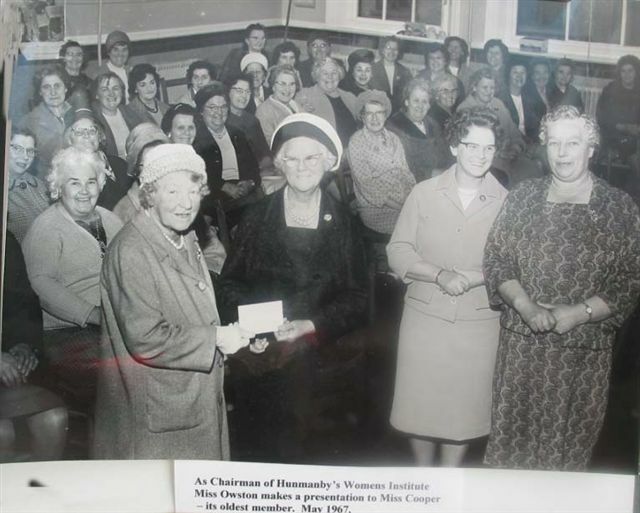 Funds raised at this and the ‘Summer Sale’ would enable every villager over 65 to have a grocery voucher of 10/-d (in 1949 - now 2005, £5.00), therefore continuing the charitable aim of the Widows Procession. 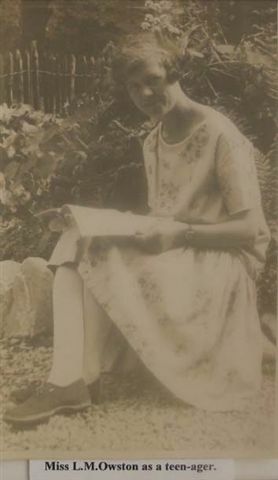 Her influence spread over many village interests, specially those connected with the Methodist ministry. Her final act for the village was in 1973. The county boundary changes were in full swing and the East Riding of Yorkshire was erased out. The East Riding was to be divided up (locally) between the newly-formed Humberside and the existing North Riding. Hunmanby, on the extreme northern boundary of the old East Riding had to make a choice - did we remain with Bridlington, now in Humberside or move into the North Riding and come under Scarborough ? A public meeting was arranged by the Parish Council, now chaired by Mr Cherry. It was held in the (now demolished) Youth Club in Bowling Green lane. After a somewhat noisy and very undecided audience, in desperation Mr Cherry invited Miss Owston onto the rostrum to give her views. Immediately the crowd settled down and Miss Owston, in her experienced tones suggested that as Hunmanby was still basically an agricultural community, it would be better to align ourselves with North Yorkshire, likewise strong in agriculture, rather than the more proposed industrialised Humberside. She was listened to in earnest and her reasoned proposals carried unanimously. Although out of office, it was her valid commonsense which again prevailed. The foregoing gives some idea how the village of Hunmanby evolved p0st-WW.2 and that the late Miss L.M.Owston was the prime mover through-out. As an East Riding County Councilor she was also involved with many interests in adjoining parishes such as Filey, Reighton, Burton Fleming and similar but these are beyond the scope of this article. As a Councilor, she was consulted by villagers on many different themes and her door at ‘Heathfield’ 127 Stonegate was always open to callers.